This year's Glasgow International sprawls across 75 venues, features the work of over 200 international and local artists, and features a curatorial theme focusing on the city's post-industrial status. Chris Sharratt reports. Is there something in the air at Glasgow International? Maybe it’s a touch of melancholy; perhaps it’s suppressed anger, a smile through gritted teeth; or could it be the weight of nostalgia, the certainties of the city’s strident, muscular history haunting the shaky foundations of our post-industrial, neoliberal landscape? 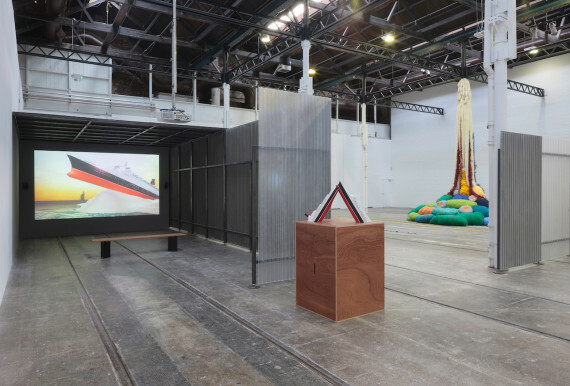 Such thoughts are prompted, in part, by the theme of the biennial festival – or at least the commissioned ‘Director’s Programme’ – which folds together the particular history of Glasgow with broader ideas around production and consumption, manufacturing and what it is to make. It’s a theme that feels timely, and soberingly appropriate. At Kelvin Hall, there definitely is something in the air – the smell of coal tar, courtesy of Claire Barclay’s sculptural installation, Bright Bodies. This is bold, robust work, a tough industrial assemblage with a vulnerable underbelly. Drawing inspiration from its site – built 1927, in 1951 Kelvin Hall hosted the Exhibition of Industrial Power, and for some time was home to an annual circus – there are steel cages, beautifully machined metal parts, coal dust hanging in red and orange cotton containers. 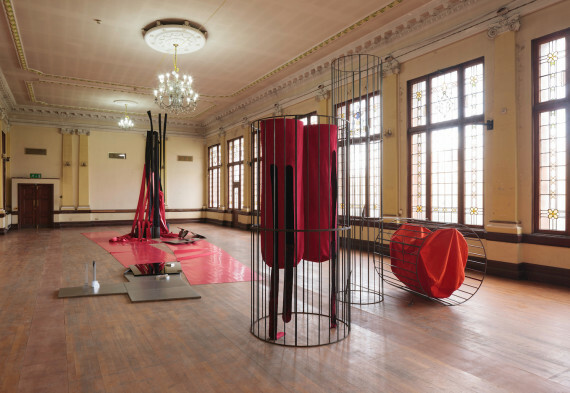 Two long, red rubber ‘rugs’ dominate the floor, lit by the room’s chandeliers; strips of the same rubber, along with black fabric, cascade from ceiling to floor. In this constellation of useful-looking, unmoving parts, Barclay conjures a strong sense of something missing, of time past. 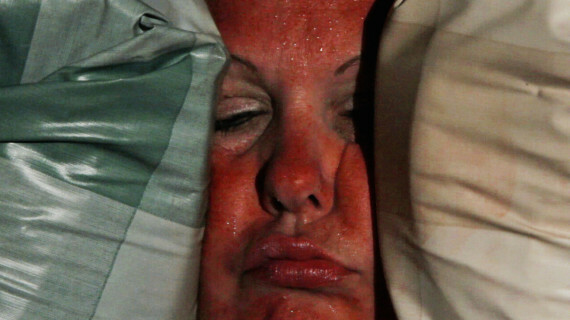 Mika Rottenberg’s two films at Tramway are anything but static. In them, our modern, connected lives are played out via crudely mechanised installations that provide fantastical, wormhole-like global links between consumers and producers. Part of a group exhibition across the venue’s three spaces that also features Alexandra Bircken, Amie Siegel, Lawrence Lek and Sheila Hicks, the show is curated by GI director Sarah McCrory and co-designed by Martin Boyce; corrugated fences with viewing apertures provide a clever framing device in the wide open space of the main gallery. 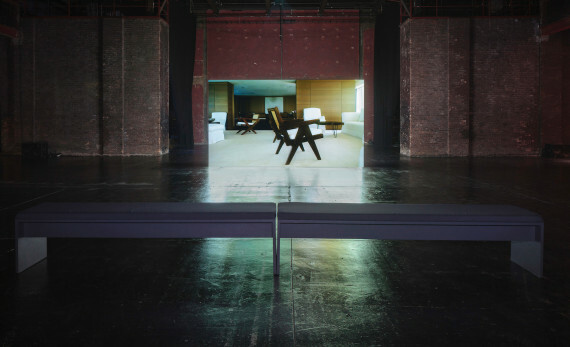 Siegel’s film, Provenance, is the slick showstopper here, given a room of its own in Tramway’s theatre space. It charts, in reverse, the journey of modernist furniture from the city of Chandigarh, designed by Le Corbusier and Pierre Jeanneret. Beginning in collectors’ homes, we move through auctions, preview exhibitions, the restoration process, shipping, until we’re back at the start in India. Across its 40 minutes, the creation of value is explored, at the same time exposing a kind of consumerist tyranny, as everyday functional beauty is transformed from something for the many into luxury items for the few. A short film, Lot 248, shows the sale at auction of the film we’ve just watched; there’s a gloomy inevitability about it all, a feeling of shoulders shrugged. Can everything be bought? Pilvi Takala’s video works at the Centre for Contemporary Arts have none of the sweeping shots and high production values of Siegel’s films, yet they are just as effective. Gently dissecting social relationships and cultural rules, they reveal institutional absurdity, unexpected kindness and ingrained behaviour. There’s Takala in a Snow White costume being told by security guards that she can’t go into Disneyland Paris dressed like that; a businessman on a tram is persuaded by a young man to lend his jacket and tie for a job interview; Takala as shop assistant surreptitiously zips up a shopper’s bag and returns a dropped hanky to someone’s pocket. It’s a fantastic, addictive selection of work, full of questioning wit and humanity. 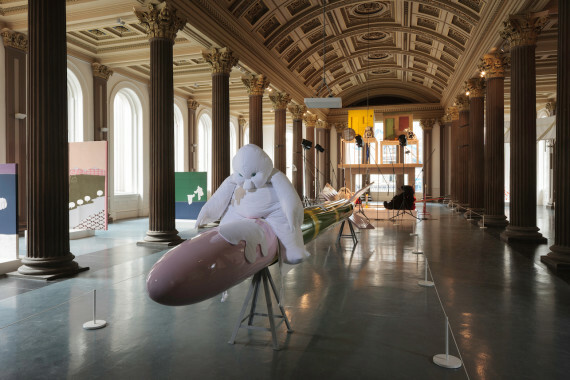 At the Gallery of Modern Art (GoMA), the main groundfloor space is packed with Cosima von Bonin’s oversized, cuddly toy-like sea creatures ‘sitting’ at desks, draped over tables and, as you enter the gallery, straddling a large missile. 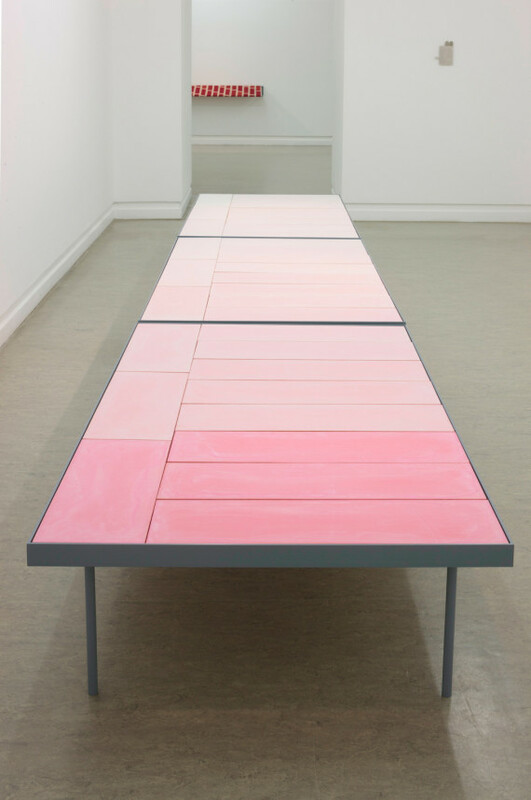 It’s like a boutique of weird possibilities, a surreal stage set waiting for someone to shout, “Action!” Upstairs, Tessa Lynch’s Painter’s Table offers a quieter collection of sculptural works that relate to her experience of Glasgow’s architectural environment. At first look rather dry, the drama of the installation is activated by a piece of conversational wall text that provides context and character as the idea of the female flaneur is explored. With its many venues across the city (the festival map lists 75), GI is custom-built for the flaneur, male or female. 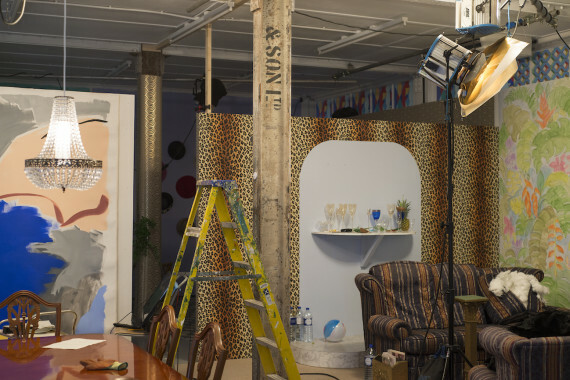 Over in the city’s east end, Sol Calero has turned David Dale Gallery into a set for a telenovela, the series filmed in the lead up to the exhibition opening. At The Modern Institute (Aird’s Lane), a mangled, black-painted steel sculpture by Monika Sosnowska – resembling flattened and distorted fencing – all but fills the space. Just across the Clyde at 16 Nicholson Street, a collaborative show from Duncan Marquiss and Toby Christian sees abstract film projections flickering on the walls amidst a series of angular, knee-high partition walls. A short walk away at 42 Carlton Place – a reliable source of art historical surprises at GI – there’s a small but fascinating show by the American painter, Louis Michel Eilshemius (1864-1941). Nearby, in a part-derelict former court room in Oxford House, Kate V Robertson has installed a wobbly ‘cobbled’ concrete floor made from casts of take-away food containers and similar packaging. 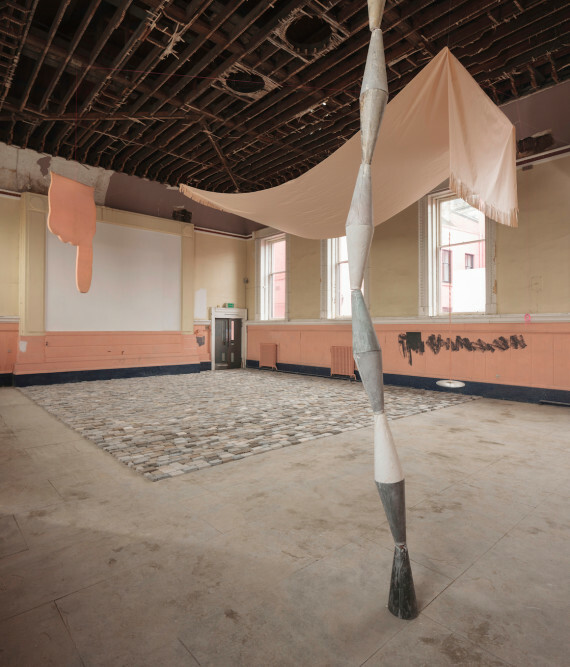 A large pink foam finger points down from the exposed ceiling; a full-size sheet of Financial Times newsprint is suspended above, its ends shredded; high windows are smudged with repeated finger prints (the artist’s) in whitewash. It’s an evocative collection of interventions and materials that seems to speak of shifting priorities, changing times, disposable lives and ideas. A GI highlight, then – and still so much more to see. 7. Sol Calero, Desde el Jardín, production still. David Dale Gallery, Glasgow, 2016. Commissioned by David Dale Gallery and Glasgow International 2016. Courtesy the artist, David Dale Gallery, Glasgow, Conglomerate.tv and Laura Bartlett Gallery, London. Photographer: Max Slaven.